@@Tom Kellie, there is a name for that: Photo-bombing. I've read the term but never grasped its meaning. Queen Elizabeth II was described last year as ‘photo-bombing’ someone, which baffled me. Thank you for bringing me up-to-date! The reddish sunlight intensifies the giraffe's beauty. The pin-sharp focus and cloudy sky enhance this fine image. ~ Photographed on 22 July, 2015 at 5:09 pm in Samburu National Reserve, Kenya, with an EOS 1D X camera and an EF 400mm f/2.8L IS II super-telephoto lens. 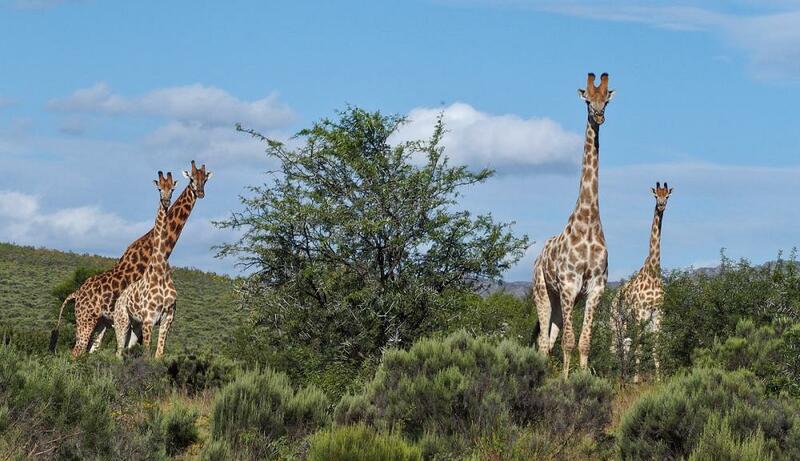 During the afternoon game drive a small herd of Reticulated Giraffe was encountered. The early evening filtered sunlight intensified the beauty of their pelage. This particular giraffe had a distinctive marking on her hip which resembled the linked lenses of a pair of spectacles. Was it an example of literal ‘hindsight’? 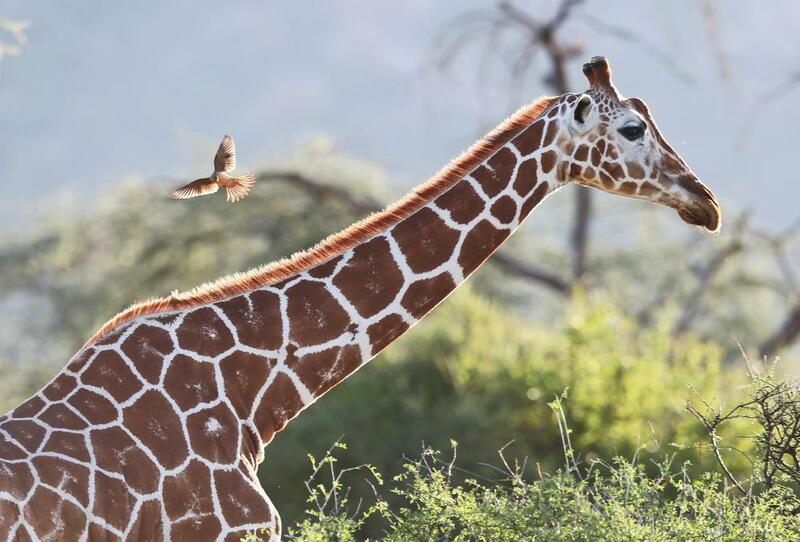 Photographed at 4:38 pm on 28 April, 2014 in Samburu National Reserve, Kenya, using an EOS 1D X camera and an EF 400mm f/2.8L IS II super-telephoto lens. ISO 200, 1/400 sec., f/4, 400mm focal length, handheld Manual exposure. This image was made during the afternoon of my first-ever game drive in Samburu National Reserve. The thrill of being there was heightened by the beauty of the species we encountered. Having never previously seen a Reticulated Giraffe, this lovely animal brought a large smile to my face. The oxpecker in attendance added unexpected action to the portrait. Where was this giraffe quartet photographed? The vegetation in the foreground is unfamiliar to me, therefore I'm curious as to the location. The ossicones on the nearest giraffe are as full-bodied as I've ever seen! 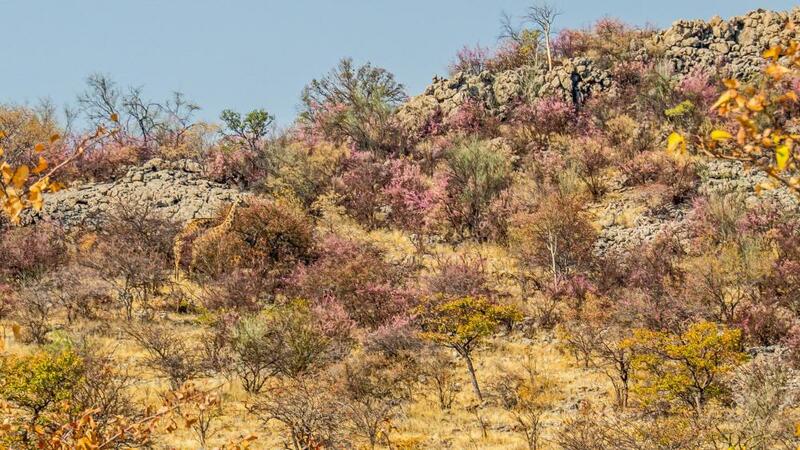 I just love the spring flowering trees in Etosha NP Namibia with the giraffe. That scene ranks as perhaps the most evocative in all Safaritalk what life on a planet in a far galaxy might look like. Gorgeously otherworldly, yet you photographed right here on our own lovely blue planet. Everything about it is a prizewinner in my book! Looking at your image again, all it lacks is a cherub or two hovering overhead! Your magnificent image is like a dream — giraffes as the dominant species! Beautifully framed scene, the likes of which I'd never imagined. A beautiful image of a beautiful giraffe. I like the wide cream-toned spacing between the patterns. So unlike the giraffes I've seen in Kenya or in South Africa. I especially admire how you've captured it eating, outstretched dark tongue and all, in such a way that we might enjoy it. Very nice — Thank you! Note: This last photo… I have seen Reticulated giraffe with certain Rothschild's giraffe characteristics (less crisply defined polygonal patterns and fading out of the patterns in the lower legs) on the west side of the Ewaso Nyiro River in Laikipia. This reticulated giraffe population is separated by the Rothschild's giraffe population (occurring in the Rift Valley Lakes area to the west) by a steep escarpment. 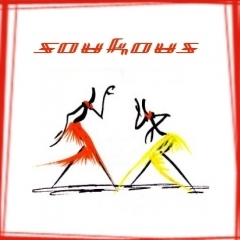 Is it possible that the two populations had genetic exchanges in the past? I have also seen Reticulated Giraffes that definitely had some Rothschild's Giraffe characteristics (animals very similar in appearance to those in your photo) near Laikipia Wilderness Camp, which borders Sosian to the North. The adolescent animal below was actually observed very close to the border with Sosian. 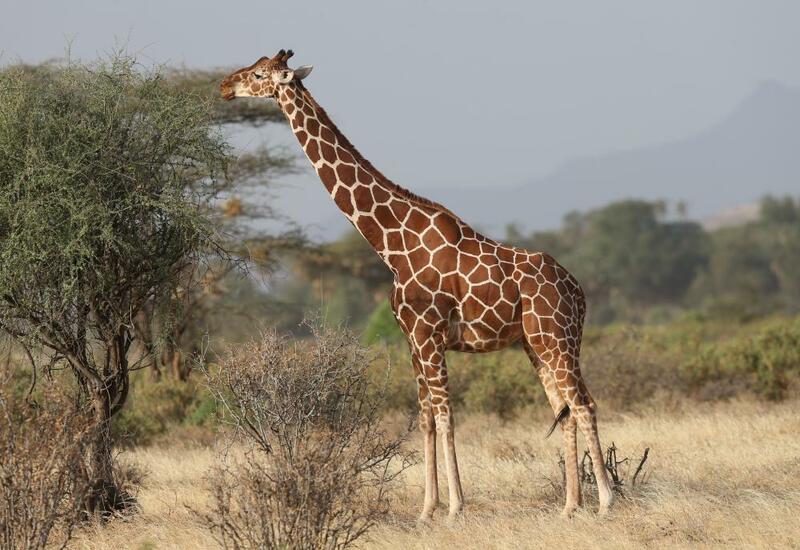 I think it is possible that the Reticulated Giraffes in the NW part of Laikipia could have had some genetic exchanges when Rothschild's Giraffes were common in the rift valley to the West. In fact, some giraffes on Mugie Ranch, on the edge of the escarpment at the NW tip of Laikipia and close to the Rift Valley, look more like Rothschild's than Reticulated! Also, have you ever seen/photographed the Galana River hybrid of Masai x Reticulated Giraffe? Yes, I believe I have. The following two photos were taken about 10 km southeast of Voi in Tsavo East National Park (that's quite far south from the Galana River!). The individual in the foreground in the first photo looks more like a reticulated, versus the one in the background that appears to be more of an intermediate form. The second photo includes the two individuals in the first photo, plus a much more Maasai giraffe-looking individual on the left. It provides a good comparison. No doubt that animals were able to cross the wide Tana River (which is the general demarcation line for Maasai vs. reticulated) years ago… for example, there are Somali ostrich in Tsavo East south of the Tana, not Maasai ostrich. @@hubertj what an incredible sight. Was your photograph taken at Okaukuejo? Southern giraffe I think? This was taken in the Matopos last September, the early evening light was beautiful. Apologies for the layout of this post, the best I can do! @@Seniortraveller - thank you and yes, exactly the photo was made at Okaukuejo. Unfortunately I was a little bit late on this sighting, as the giraffes already started to back down to the bush at the moment I arrived. It was the last moment to make a shot. I like your photo too. The light indeed was great, the giraffe is looking handsome with those wonderful colors in the background. Have a nice day ! I've not contributed any photos so far so I thought it was about time I did as there are no photos of Kordofan giraffes G. c. antiquorum as yet so I'll add some from my two Zakouma trips. Then we only need some shots of some Nubian giraffes G. c. camelopardalis to have photos of the full set, look at the following distribution map I think adventurous though I am I won't be volunteering to bring that the first photos just yet. Why are they called ‘Kordofan giraffes’? Is that the designation of a sub-species? The Kordofan Plateau is a region of central Sudan which includes the rugged Nuba Mountains it is divided in to two provinces North and South Kordofan I presume that the first specimen of the Kordofan race/subspecies of giraffe Giraffa camelopardalis antiqurom was shot somewhere in this part of Sudan presumably back in colonial times in the days of the Anglo-Egyptian Sudan. Since the original modern state of Sudan was split in two, giraffes are now to my knowledge extinct in the north in Sudan so there are now no giraffes at all in either North or South Kordofan, but populations of Nubian giraffe G. c. camelopardalis survive east of the Nile in South Sudan, however the Kordofan giraffe would appear to be extinct in South Sudan also. The following IUCN map shows a population of Kordofan giraffes in the DRC in Garamba National Park on the border with South Sudan but I think there’s a question mark over exactly which race of giraffes these ones in Garamba actually are. 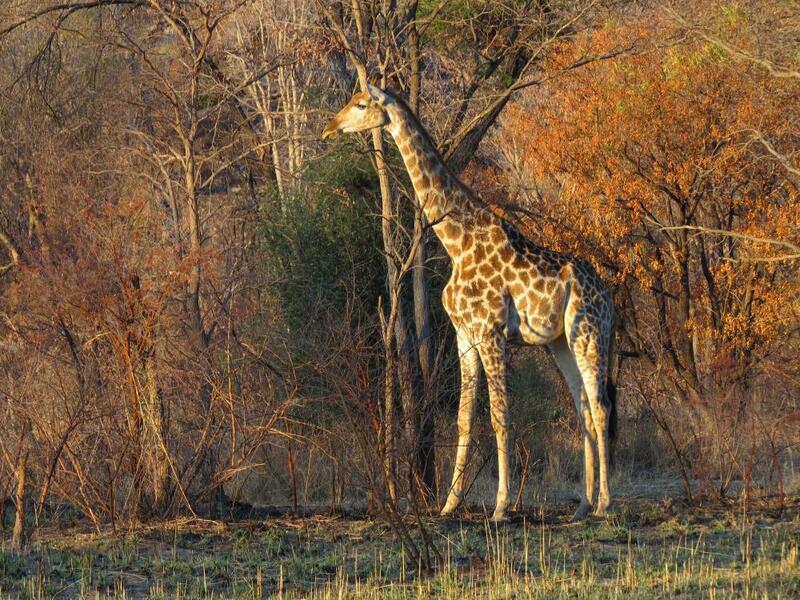 Some years ago scientist concluded on the basis of genetic evidence that some of the giraffe subspecies may actually be full species however I think until further research has determined if this really is the case and exactly how many distinct species there ar, they will continue to be regarded by most people as a single species.